A novel form of neurodegeneration with brain iron accumulation? From the Département de Neuropédiatrie (A.R., B.E., P.M., F.R. ), CHU Gui de Chauliac, Montpellier; Institut des Neurosciences de Montpellier (A.R., N.H., G.M., C.P.H. ), INSERM U1051, Université de Montpellier; Service de Neuroradiologie (C.-J.R., N.L. ), CHU Gui de Chauliac, Montpellier; Equipe MitoLab (M.C., G.L. ), UMR CNRS 6015-INSERM 1083, Institut MitoVasc, University of Angers, France; Department of Medical Genetics (C. Goizet), Hopital Pellegrin, Bordeaux University Hospital; MRGM Laboratory (C. Goizet), INSERM U1211, University of Bordeaux; Laboratoire de Génétique Moléculaire (C. Guissart), CHU de Montpellier; U1046 INSERM (P.M., F.R. ), UMR9214 CNRS, Université de Montpellier; Department of Neurology (C.M. ), University Hospital Gui de Chauliac, Montpellier; Centre de Référence des Malformations et Maladies Congénitales du Cervelet (L.B. ), Service de Génétique, Hôpital Armand Trousseau, AP-HP, Paris, France; Wellcome Trust Centre for Mitochondrial Research (R.H.), Institute of Genetic Medicine, Newcastle University, United Kingdom; and Centre of Reference for Genetic Sensory Diseases (C.P.H. ), Montpellier, France. 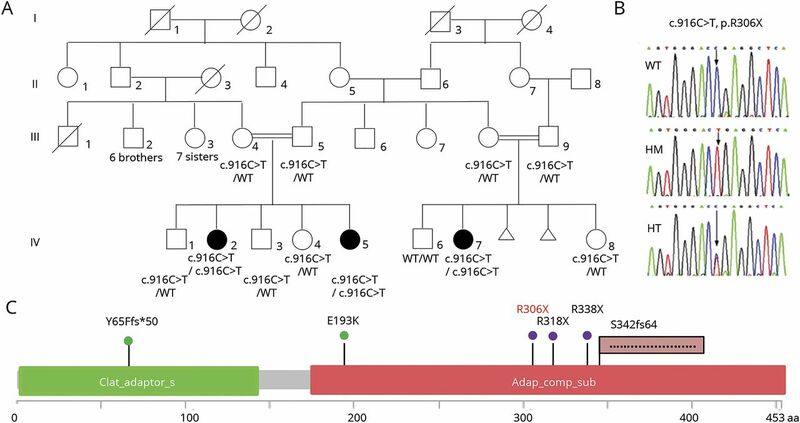 (A) Pedigree showing the segregation of the AP4M1 c.916C>T (p.R306X) mutation in the family; black symbols indicate affected patients. (B) Electrophoregrams showing the wild-type (top), the homozygous mutated (middle), and heterozygous (bottom) sequence of AP4M1. (C) Localization of AP4M1 mutations in the protein: the structure of the AP4M1 protein (domain and amino acid positions) is described with all the pathogenic missense mutations5,14 (green), nonsense mutation9,15 (violet), frameshift4,13 (pink flag) mutations reported to date (in black), and in the present cases (in red). HM = homozygous; HT = heterozygous; WT = wild type. (A) Patient IV-2, 25 years. (B) Patient IV-5, 16 years. (C) Patient IV-7, 23 years. (D) Control, 20 years. (A.a, B.a, and C.a) Photographs showing dysmorphism, with bulbous nose, broad nasal bridge, coarse features, and wide-open mouth. 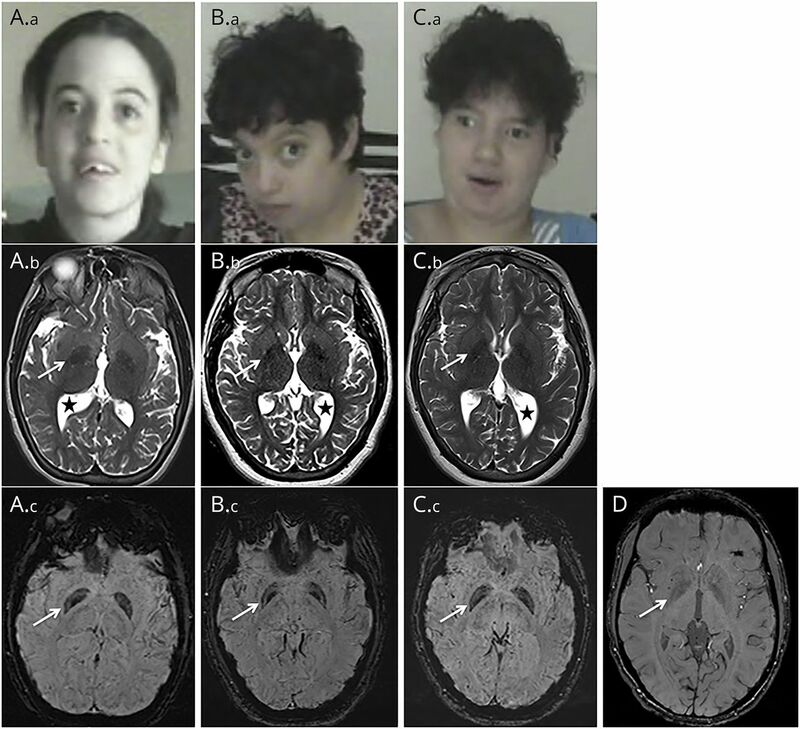 (A.b, B.b, and C.b) Axial T2-weighted sequence showing asymmetric ventriculomegaly (black stars) and mild hypointense aspect of the globus pallidus (arrows). Diffuse brain atrophy and loss of white matter without signal abnormality, particularly in occipito parietal areas, are also observed. (A.c, B.c, C.c, and D) Axial susceptibility weighted imaging sequence showing bilateral intense hyposignal of the globus pallidus, significantly predominant in their medial part (arrows, A.c, B.c, and C.c) compared with the control (D).